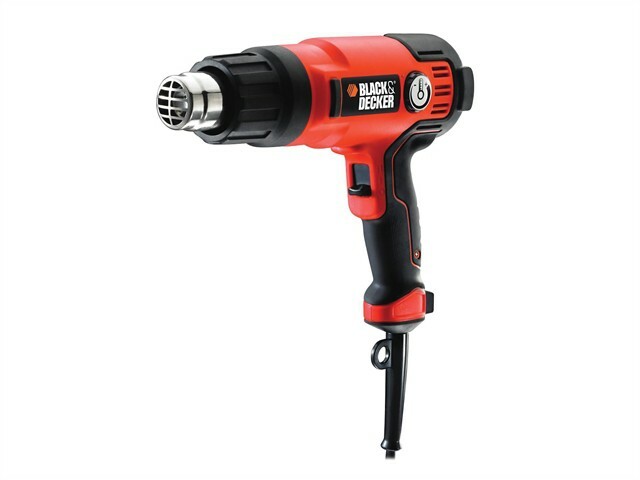 The Black and Decker KX2200K Heavy-Duty Heat Gun is a powerful 2,000W, 2-speed heat gun with variable heat to give maximum control in all heat gun applications. This complete kit includes 8 accessories and a kitbox. Ideal for stripping paint, varnish, adhesives and a variety of other applications. Stripping paint, adhesives or varnishes. Loosening rusted or seized nuts. Reflector Nozzle - for working around pipes or in enclosed areas. Glass Protection Nozzle - protects glass when working on window frames. Reduction Cone - concentrates heat into a smaller area for tough applications. Wide Nozzle - for working on larger work pieces. Scraper Handle with Tear Drop Scraper Head. Scraper Head - Multi Sided (fits Scraper Handle). Scraper Head - Triangular (fits Scraper Handle).